road was a bike club. Around that same time in the 70's, Evel Knievel was the man, leaping the Grand Canyon, jumping up and yelling "I'm OK!" with multiple broken bones. He generally inspired me to leap off the swingset at the highest point of the apex (breaking my arm in the process), climb the highest trees on our property and jump out of them, and drive my mother to madness. Between the bikers down the road, who watched over me with a gentle eye and kept the neighborhood redneck bullies at bay, and the exploits of Mr. Knievel, well... it was a foregone conclusion that I ended up as I did. 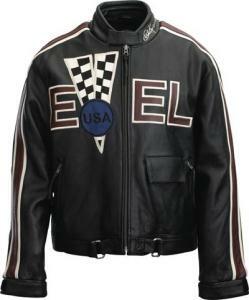 And although Evel has left us, his coat remains. This jacket absolutely rocks. mandarin collar, tasteful and not overdone gunmetal hardware, adjustable side straps to fit your waist, outer and inner pockets, and a heck of a lot of style. This coat does not have body armor -- it's livin' on the edge, just like Evel! Hard to find but retailing at about $70, it's worth looking for. Man, get the facts right. It was not the Grand Canyon, it was the Snake River Canyon.